Leaked Copy of 'The Secret Life of Walter Mitty' Linked To Ellen DeGeneres. Oops. When someone mentions Ellen DeGeneres’ name, things like Finding Dory, “It’s time to dance,” and “super awesome” might come to mind. So when a pirated copy of The Secret Life of Walter Mitty started floating around the Internet with DeGeneres’ watermark on it, my first reaction was, “No, it can’t be.” However, a rep for 20th Century Fox told Variety that, although the copy was not an Oscar screener (the comedienne is set to host the 2014 ceremony), the watermark indeed “appeared genuine” and was created for The Ellen DeGeneres Show in the fall. I haven’t ever been to California and have only watched her show through my TV screen, but I can say that DeGeneres is the most genuine person I have never met. There’s nothing negative about her talk show. The purpose of it is to interview accomplished celebrities, make dreams come true for families in need, and get a laugh out of the audience. Although she has never yelled out, “You get a car! You get a car!” (fingers crossed she will when I finally make the trek to the coast), she frequently, if not always, has giveaways and prizes for those attending the show. Still, DeGeneres — she of the 12 Days of Giveaways — would never give away anything she shouldn't, like a watermarked DVD, right? Nah, she's not interested in spreading piracy — just holiday cheer. During every show, DeGeneres' DJ plays upbeat music while she encourages the audience to raise to their feet to dance. And everyone knows that dancing not only puts you in a happier mood. Exercise gives you endorphins, and endorphins would never lead you to break the law. Right, Elle Woods? It doesn’t really matter whether she’s met them time and time again (e.g. Taylor Swift) or is introducing them on the show for the first time. 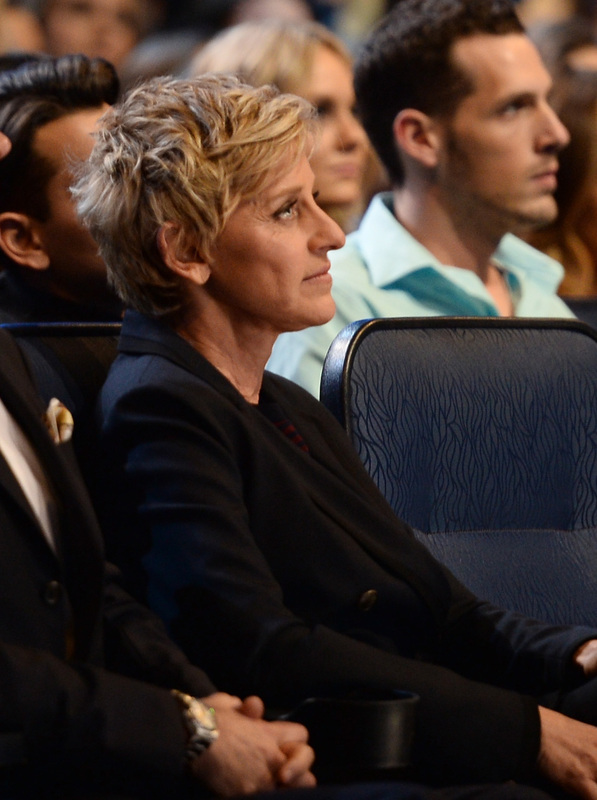 DeGeneres is pretty much BFFs with everyone. That, or there isn’t a single celebrity who doesn’t want to be her friend. In December, DeGeneres had Ben Stiller on her show to talk about The Secret Life of Walter Mitty and the pair reminisced over anniversary “undergarments” DeGeneres gifted to him the last time he was on the show. This time, she presented him with another set of personalized, Star Trek-themed underwear. Clearly, she's fighting against the dark side, she is. Adults, teenagers, kids, men or women… it doesn’t matter. Everyone is on Team Ellen. She’ll talk about anything from politics to bullying at schools, but always makes her discussions family-friendly. She knows how to appeal to individuals of any age, race, or gender, and is loathe to offend anyone at all. And that includes major film corporations. DeGeneres ends her show with this sentence, and lives up to it. The host has reunited military wives with their husbands, has given a home to Hurricane Sandy survivors, and gives gifts and money to struggling single mothers, among many other heartwarming deeds. She also helped Talia Castellano, a young girl who died from cancer, become an honorary CoverGirl when she was previously on the show. So, come on, people. If you still think DeGeneres would do something like leak a major movie, then there’s probably something wrong with you. Just look at this face.